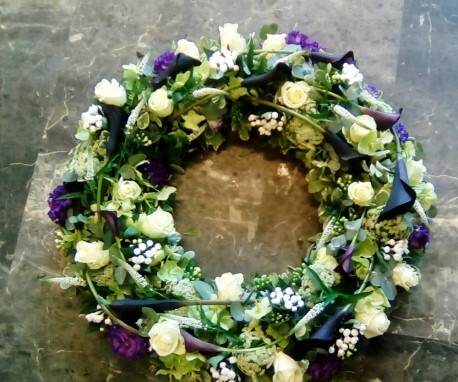 A contemporary wreath designed with calla lilies as the main feature. Around the contorted stems of the calla lilies we have worked with spray roses, bouvardia and eculyptus. Colours may be changed, please notify us at the time of placing your order. Flowers may vary due to seasonal availability. Flowerscene are delighted to offer this contemporary wreath for delivery in Aberdeen and surrounding areas.